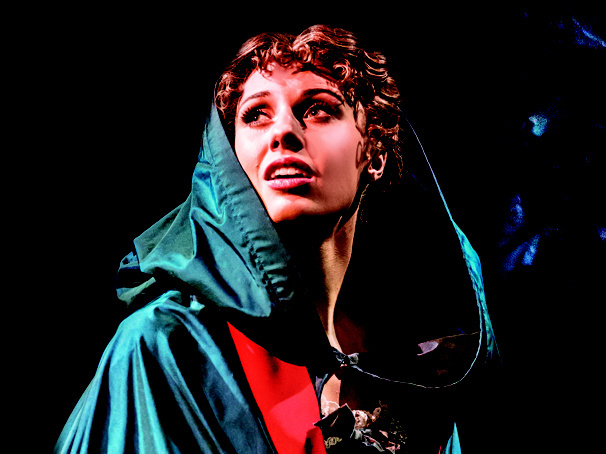 Dutch actress-singer Celinde Schoenmaker will mark West End history on October 10 when she appears as Christine Daae opposite Ben Forster as the Phantom in the 30th-anniversary performance of The Phantom of the Opera at Her Majesty’s Theatre. With only one other London stage credit to her name (Fantine in Les Miserables), an animated Schoenmaker took time early one recent evening to share her excitement in helping celebrate a theatrical milestone. You must be counting down, with just days to go now until Phantom turns 30. Sure, but we always do our best for every show we do, so really there shouldn’t be any difference. The challenge is to stay calm and treat it as any normal night—think about it as just as another Monday with a beautiful party afterwards. Is it “pinch yourself” time? Yes, though I won’t be doing a lot of pinching beforehand. It’s when I am in bed afterwards and everything has been done that I will go, “That was amazing!” Until then, I’ve still got a job to do. You must have known when you took this contract that you would be the lucky Christine during this birthday year. Is there a community of Christines that has built up over time? Harriet [Jones] who played Christine before me and is now alternating and I have become very good friends and my boyfriend [actor Richard Fleeshman] did a piece with Anna O’Byrne, who was Christine, so is there is that sense of connection. The alternate and I share a dressing room and have the same dresser, so we’re like a little team—and there’s no competition, which is lovely. I don’t know Sierra but we know of each other. I took over from her as Fantine on the West End in Les Miz. She was right before me and left a lovely card with a small stone for me in my dressing room that contained all these beautiful words and wished me well when it came to freshening the show for myself. That must have been important to hear. It was! Fantine was my very first experience in a lead part, so it was a lovely way of Sierra showing me how the hand-over is done, and so now as and when someone takes over from me, I hope I can do the same for them. I thought that was a really beautiful way of doing it. Do you have a connection to any of the earlier Christines? It can be daunting when you think how many incredible women have played this part; we were thinking backstage that it might be nice to make a little shrine for all the Christines, with headshots of all the women who have played the part. The amazing thing with Claire [Moore] is that I actually studied from her and she helped me so much in preparing for this role. I think my natural tendency was to take the piece quite heavy and Claire would say, “No, no, think of it as lighter; you need to work on that!” Her whole attitude was about enabling me to take on the role with confidence instead of being scared. She gave me the faith that, yes, I could do it. It’s quite a different assignment from Fantine. Fantine is much more belty. I think if you’re doing Cosette in Les Miz that you can more easily make the switch to Christine, but I was doing Fantine while auditioning for Christine, so during the day I’d be doing all my classical training and then in the evening I would have to belt—which meant the next day was all about working hard to get my soprano back to where it had been the day before. As Christine, you’ve got two men vying for your affections right up until the final curtain. Yes, and it can be really hard to stand up to one that is essentially a murderer and say, “No, no, that’s enough” because at that time especially women didn’t have the rights that men have. What was important then was to be this beautiful housewife or mother but because Christine has this voice, she, in the end, is able to put her head down and say, “Enough!” That for me as an actress is the most interesting thing: to stand up to someone and not just go along with their wishes. You clearly admire her as a character. I actually think I would want to be her! She’s so loving and so seeing the good in everyone, and the decision she makes at the end is beautiful. I know that if I were to get to know her, she would be a really good friend of mine. It’s interesting that you can now study what happens subsequently to Christine by checking out Love Never Dies, the sequel to Phantom. I haven’t seen it. When I started, they said to me, “Don’t look at Love Never Dies,” so for me what happens in Phantom is what happens and that’s that. I actually have two DVDs of Love Never Dies, and I will get to them at some point. I assume it helps that you get along with your Phantom [Ben Forster]. We have from the very first day we met, and it helps that we have the same sense of humor. I just love Ben’s physicality in the part, among other things: I always say he’s like a panther! They’re always so lovely and welcoming, and they give me the kindest gifts and drawings. I think you enjoy the whole experience of the part so much more because they’re so in love with the show and with this part. Let’s hope they just keep on coming!